Train Derailment on the West Branch of the Delaware River - Upper Delaware Council, Inc.
Beach Lake, PA – Yesterday at 2:01 am a west-bound train, departing from New Jersey heading to Binghamton, with 4 locomotives and 63 railcars derailed west of Hale Eddy Road in the Town of Deposit, New York. Diesel fuel leaked into the West Branch of the Delaware River and was carried into Upper Delaware Scenic and Recreational River. A sheen of oil and the smell of diesel was observed as far south as Lordville, NY. 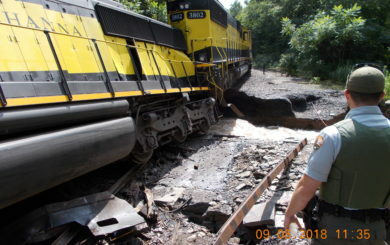 The New York, Susquehanna and Western Railway Corporation reported at the end of the day that fuel was no longer leaking at the site and containment efforts had been implemented. Today, NPS assessment of the river is that high river flows have carried the fuel oil out of the park. Some very small localized areas where river flows are slow may have some residual oil and, if observed, property owners are asked to notify the National Park Service by calling Superintendent Kris Heister at 570-729-8251 ext. 2225. There are no restrictions on recreational use of the river today outside those in place as a result of continuing high flows. At 9:00am the river height at the Barryville river gage was 7.05 feet and flow was 11,100 cubic feet per second. Therefore wearing a properly fitted life vest today is mandatory and we recommend only the use of rafts on the river. Media inquiries on the status of the train derailment should be directed to Melanie Boyer at the New York, Susquehanna and Western Railway Corporation at 607-547-2555 ext 250.